Hello all! Hope things are super in your world. Mine has been pretty darn good here lately, for several reasons. I’m doing very well on my low carb eating plan. I had a great birthday weekend this past weekend. I am up to the eyeballs in new theater things looming on the horizon. Things are just… pretty darn good. So let me tell you about my birthday evening with my kiddos. 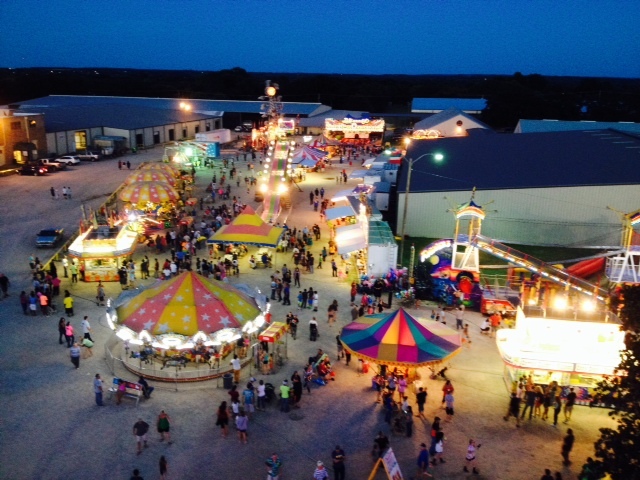 Some of you may possibly not live in a small southern town, and have possibly never experienced anything as culturally specific as a County Fair. Well, let me enlighten you, if I may. Settle in, now. Ready? Ok. So the Carter County Free Fair has been going on for scads of years. Eons. I’m not sure, but I’m too lazy a blogger to go look it up. Anyway, it’s a tradition. When I was growing up we used to go to the fair every year- it was always the first weekend in September. Now, let’s get specific and identify some definitions. 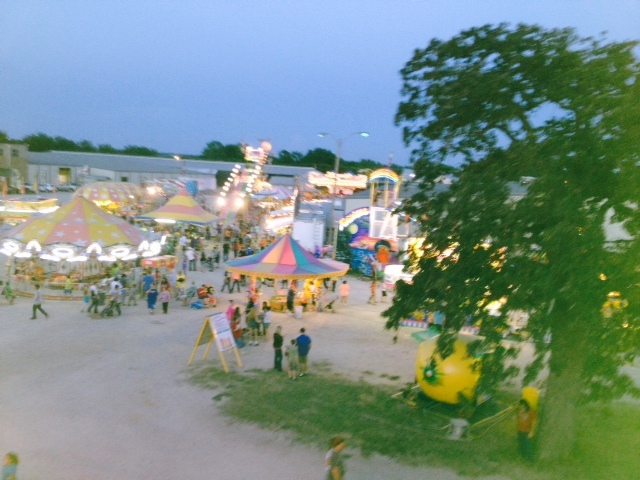 The Fair is a term used to describe the entire event, but it is actually composed of two parts- the County Fair, and the Carnival. The County Fair is exactly like the ones you used to read about in your old story books, where people bring everything from goats and pigs to quilts and preserves, to be judged against everyone else’s. The animals are usually shown by kids raising them for 4-H projects. My mother used to enter photos in the fair, years ago, and she won several ribbons. The Carnival is a different animal. It’s your typical affair, loud music streaming from brightly lit thrill rides, slightly…strange-looking people hawking absolutely un-winnable games (ok, mostly un-winnable), and tantalizing smells emerging from travel trailers full of FAIR FOOD! Aka, Junk on Wheels. Aka, Heart Attack on a Paper Plate! Funnel cakes, kettle corn, corn dogs, sausage, cotton candy, pretzels, nachos, corn on the cob, turkey legs, deep-fried ANYTHING, sodas, fruity drinks, all made while you wait, ridiculously overpriced, and oh-so-good. So we went to the fair Friday night, me and my kiddos. It was my birthday, but even if it hadn’t been, we would have gone anyway, and ONLY because Miss Moneybags, aka Daughter J. had been saving up her money to take herself, her boyfriend, and her siblings, to the fair. This was a much-anticipated and long planned event, you see. Well let me tell you, there were a number of thoughts that crossed my mind as we meandered through the games, food, and animals on display. First and foremost, is the Culture of County Fair People. Now, everyone in my group was wearing knee-length or longer shorts or pants. But my goodness! The clothing (or LACK thereof!) on the girls I saw! Skin tight shorts just barely covering their butts, mysteriously coupled with boots. Shirts that looked like they had been mangled by a mountain lion, strategically placed rips and tears and tie-ups that seem thoroughly dedicated to showing as much skin as possible while technically remaining “dressed.” (Kind of like Miley Cyrus wearing pasties to fashion week, but that’s a whole other kind of tacky.) And on the other extreme, the “emo” or “Goth” or “skater” kids who for some reason decided to attend the fair wearing hoodies, despite the fact that it was still over 90 degrees at 8:30 at night! And, categorized as perhaps less strange and more mildly amusing, the “Cowboy” types who saw it as an opportunity to wear their best starchy jeans, their button down shirts, their pointy-toe boots and their HUGE glittering belt buckles that would put the Crown Jewels of England to shame. In addition were tired, stringy-looking grandmas, wrangling three or four toddler grandkids, Yuppie parents with strollers and wagons, complete with Soccer Mom performing the Lysol and Wipe Ritual in a ring around them every 10 steps. We even saw a couple of … hmm, how to say this? Interesting-looking ladies carrying a sign for a petition to legalize marijuana. Anyway. As I mentioned, it was definitely hot and sweaty. Walking through the animal barns and in the show arena, I somehow managed to get sand between my toes (!) despite the fact that I was wearing sneakers and socks! Daughter J. and her BF spent most of the evening riding carnival rides together, while Daughter S. and The Boy and I hung out and explored the fair. We looked at the bunnies, and the chickens with funny hairdos, and goats. Lots of goats. 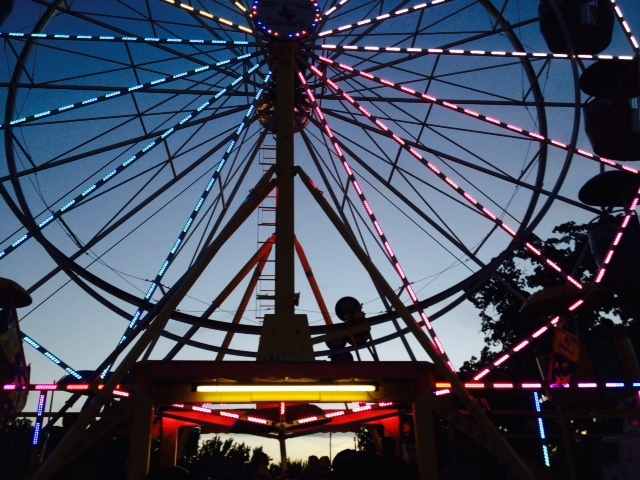 We rode only one thing together- the Ferris wheel. It was here that I almost experienced a trauma, and it came with a flashback to a similar trauma that did in fact end up happening, years ago. Here’s the scoop: when we were boarding the Ferris wheel, I let the kids get on first, and they both sat on one side of the cart, which made it swing precariously in the wrong direction, making it virtually impossible for me to squeeze my rather large backside through the little gate and get into the cart. So the very kind, and really not scary-looking at all, carnival worker and his partner swung the cart level and steadied it so I could climb in. Well… I couldn’t quite make it. I tried to step up but it was pretty high, and I was already worrying that this wasn’t going to work out and I would be humiliated in front of God and the world, but then I reached up, grabbed the cross-brace above the cart, pulled myself up, slid sideways through the cart gate and plopped into the seat, trying desperately to be nonchalant (a total contradiction in terms, by the way) about the fact that I had just very nearly experienced one of the most humiliating moments of my life. I joked it off, grinning and chuckling at the kids, and we moved on. I’m sure I told the carnival guys thank you, too, and I was hoping and praying that not too many people standing in line waiting were actually paying much attention to the people boarding the ride. So we took off, and the ride was very nice, and it was just almost dark. I took some pictures, and a short video, but the funniest part was when I kept getting frustrated while trying to take pictures as we went around, when there kept being a blue bar across the picture. I was confused, because I was sure I was missing the hub of the wheel that kept turning in front of my vision- I just knew I was timing the photo better than that, so I couldn’t figure out what on earth was getting in front of me that was making that blue bar. The Ferris wheel bar wasn’t even blue- it was white! Finally, I figured it out, and y’all… I am such a dork. 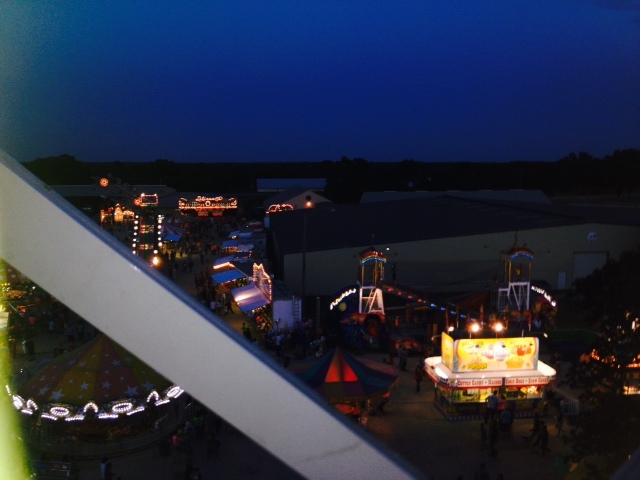 It was the far horizon on the opposite side of the fair grounds. It was the sky just above the treeline. Yeah. I’m that goofy. A little slow on the uptake, but I get there eventually. Well, we finally got off the ride, having carefully planned our exit strategy so as to avoid the same trauma as we experienced on boarding. It was thus: when the ride stopped, I was going to stand, The Boy was going to slide over to my seat and sit there while I eased myself down from the cart. Then he and his sister would have the balance to get out of the cart just fine on their own, and the poor Carnies could avoid a workman’s comp claim from holding the cart steady for my bulk to move out of it. Our carefully devised plan went off without a hitch and we all left the ride with no problems. Well, except my son, Too-Tall Jones, who bumped his head on the cart, despite the carnival workers’ repeated warnings of “Watch your head!” to all of us as we climbed down. Unfortunately, I wasn’t the only one whose experience was slightly dampened by my size. Daughter S. and The Boy were rather chagrined that they were now too big to ride the carousel. Sad face. They insisted they had been allowed to ride it the previous year, and technically Daughter S. wasn’t over the weight limit, but The Boy is, since he is now 13, taller than I, and as solid as a rock. He’s not fat, probably barely overweight now because he has gotten so tall, but the Carnie was being a stickler for rules (weight limit was 150 pounds) and decided they were both too big. So they were pretty disappointed with that. Oh, you’re still wondering about the Ferris Wheel Flashback? I didn’t think so, but I’ll tell you anyway. Years ago when my family was visiting Port Aransas, Texas, which was my dad’s favorite place to go, they decided to go horseback riding on the beach. There were several places you could go to do that, and we went there, paid up, everybody got on their horses, including my dad, who has always been a big guy but at that time was still fairly athletic, I guess you could say. Anyway, I was the last one to be given a horse, and when I went to get up on it, the saddle would start to slide toward me, and I was too afraid to just keep pulling and jump myself on up there and swing over, correcting the saddle slide as I went. So they didn’t have a step stool or mounting block, and they refused to let my dad dismount his horse and try to offer me a hand and help me up… so I had to stay behind. The van was locked and Mom or Dad had the keys, so I sat on the running board of the van, all by myself for what felt like two hours, feeling humiliated and suicidal because I was too big to join in with what the rest of the family were doing. I don’t remember what year it was, or how big I was compared to now, but I’m sure I was probably actually bigger then. So that’s the story of the Ferris Wheel Trauma Flashback and probably the most humiliating moment of my life that I can think of right offhand. Thanks for reading, and stay tuned for the next post, in which heaven only knows what I’ll confess to next! Oh- I know. Next post will be all the Theater News!